You’ve faced these first world problems on the Delhi metro. But that’s all they are — first world problems. We’re so accustomed to our daily metro routine that we’ve forgotten to appreciate this sheer awesomeness that runs all over Saddi Dilli. With the new 60km Delhi Metro line connecting Noida, Greater Noida in the offing, a lot can be said about all that this invention of E Sreedharan has given us. No traffic jams in Metro land. Traffic kills you overhead, while under the ground the metro cruises along smoothly. Result? What takes you one hour by road, takes you 20 minutes by metro. As you walk in, the cool air greets you. Think Delhi summers and you’ll agree that the A/C in metro makes life a lot easier. Not to forget the freezing winters where some human warmth is rather welcome. Even the lazy can travel easy. Yes, you may have to push your way in or out but hey if you live in Delhi you’ve probably found novel methods to counter claustrophobia by now. You can go on aDilli Darshan without burning a hole in your pocket. Mother Nature will thank you. This definitely appeals to the environment conscious. Plus remember how much it hurts when you fish out Rs 500 notes from your wallet for petrol? Yeah, now take the metro. You don’t even realise the distance you’ve travelled before you step out. Just find a quiet corner and plug in. All the metro is a music video now…and you’ve reached. You think of an inconvenience, and soon enough it’s solved! DMRC has introduced snazzy, silvery buses to connect your locality to the nearest metro station. Oh and don’t forget the Rapid Metro line in NCR. You can even use your regular metro card to travel by it. There probably is a station under construction near your house. The Delhi Metro is constantly expanding. The metro line that connects Yellow Line to Violet Line via Mandi House station was the last one to start. And chances are you’ve taken it. The metro trains are so frequent that you technically never “miss” a train. They’re definitely a lot more regularly available than a bus or an auto in Delhi. Even late in the night or early morning, a metro coach is never completely deserted. 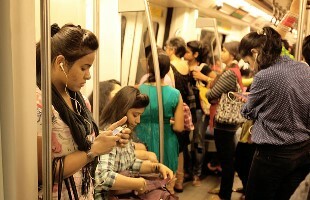 For those who want to travel safe, Delhi Metro is a good idea. Plus there’s always a cop around. You can recharge your metro card on the DMRC website. As easy as buying clothes off the internet, but far more useful. Plus there’s a Delhi Metro app that actually works. You find it surprisingly CLEAN. Name one other public transport authority in India that actually maintains cleanliness? Please don’t say Airports Authority of India. They don’t really have that big a littering issue. Speaking of airports, did you know that DMRC has cut down on its Airport Express Line fares? And wherever you go, you’ll find yourself missing it. So don’t dis your friend in need and continue using public transport. Oh and please mind the gap.